At KC Family Dental, we’re dedicated to bringing you the latest in dental technology. Now, in many cases, you can have your fillings installed painlessly with less need for anesthesia with a great laser technology known as the WaterLase™. Previous dental lasers would only work for the gums or whitening the teeth. 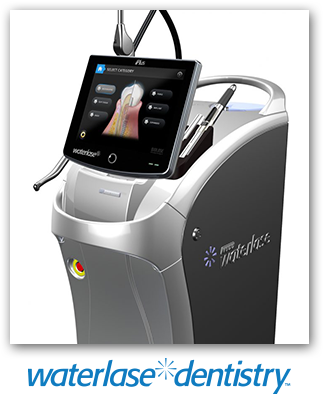 This new water laser is a complete breakthrough in comfortable dentistry. Microscopic water droplets are energized by the laser, and it this energized water that eliminates the tooth decay. In fact, for many dental procedures the WaterLase can even replace Dr. Brent’s drill. FDA-approved dental lasers offer an alternative to standard treatment typically performed with scalpels or incisions. The less invasive the treatment, the better the results and healing times. We can cosmetically treat uneven gummy smile lines, clean and re-contour swollen tissue around crowns, halt gum disease, and heal painful canker sores and mouth ulcers with instant relief. The results are incredible! If you have questions about laser dentistry, our dental team is ready to help you. Schedule online or call (913) 220-2209 today.